It’s a bright winter’s day on the south coast of Cornwall. Sunlight dazzles on windows and windscreens. The coast path rises through a straggle of trees; behind them I can see the St Austell river forming a wide loop across the beach before it reaches the mirror-like sea. I’m here to find the source of one of Cornwall’s best carving stones, the fine-grained, straw-coloured igneous rock that takes its name from the village far below: Pentewan. Pentewan stone is no longer quarried, but in the sixteenth century the cartographer and antiquary John Norden (c.1547-1625) described it as ‘the best freestone that Cornwall yieldeth.’ It is closely associated with the granite intrusions that characterise the Cornish landscape and has the same mineral composition of quartz, feldspar, and mica. In the language of geology it is a dyke, an emplacement or intrusion that cuts through the surrounding rock. Able to be followed for several miles it was also quarried at different locations, each with its own character: thus a Pentewan-type stone was extracted at Polgooth, Sticker, and Penrice, for example. Defunct workings litter the landscape of the Pentewan Valley. In the medieval period it was worked via adit quarries on top of the cliff, in later centuries from the cliff face itself. Unweathered, it’s gentle yellow can be tinged with brown, lighter than Bath stone but not too distant; weathered, it’s surface dulls to pale grey. Similar ‘white elvans,’ the regional name for these silica-rich, fine-grained igneous rocks, are found across the Cornish peninsula and vary in quality. Many of the eighteenth- and nineteenth-century houses in Truro, and indeed, parts of Truro Cathedral itself, are built from a slightly coarser variety known as Newham stone. Up on the coast path December has yet to fully bite. Dandelions and campion flower in the sheltered spaces beneath the hedgerows. In places these hedgerows disappear completely to reveal nothing but sky and cliff and white water troubling the rocks far below. The path climbs and twists, allowing a view of Polrudden Cove: this is where Pentewan stone outcrops. It is not hard to find. A streak of pale gold cuts the grey; a bright line painted across the face of the cliff. 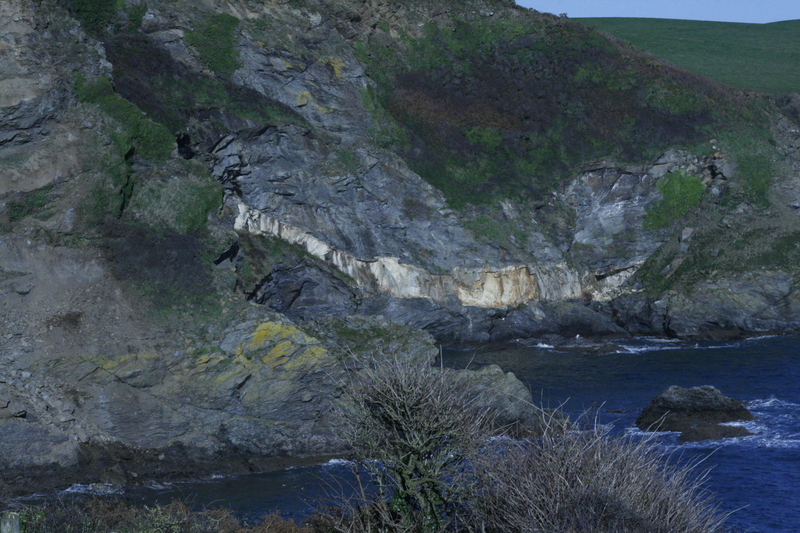 Above: The Pentewan stone outcrop in the cliffs at Polrudden Cove (Photo: Marcus Williamson). 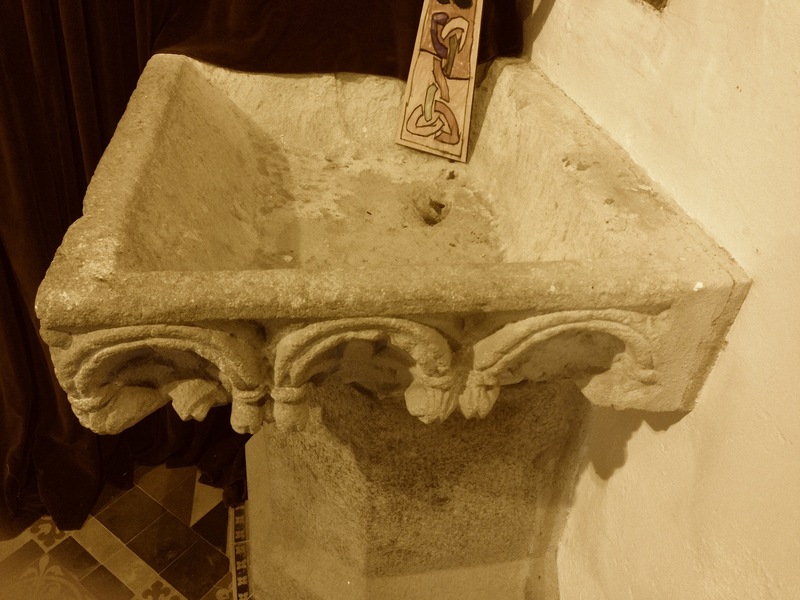 The font at Lanreath, the subject of the most recent post on this blog, demonstrates the ability of these white elvans to work well and hold a good edge, even after 800 plus years. Given that this particular example is cut from one piece it also illustrates that large blocks could be, and were, extracted. The quality of Pentewan and Pentewan-type stones in twelfth century Cornwall is illustrated not only by the amount of carved work that survives, particularly as fonts, but in the re-use of stones. At the church of Lanivet, near Bodmin, I find exactly that, a section of a large capital hollowed out to make a ceremonial basin or piscina. In his Norman Architecture in Cornwall (1909) Edmund Sedding published a handful of photographs of loose fragments originally from Bodmin Priory, and at that point, to be found in Bodmin Vicarage garden. These included capitals. The Lanivet fragment recalls these examples closely. It is an unusual design. Like an evolved scallop-type capital, suggestive of late Romanesque or Transitional Gothic (although Bodmin Priory was established earlier than either of these two stylistic periods, in the 1120s) it features a run of arches terminating in pendant bosses, each one subtly cut to suggest a leaf form. The curve of the capital, as it arches down to the granite column on which it now sits, appears to have been recarved with small decorative motifs. 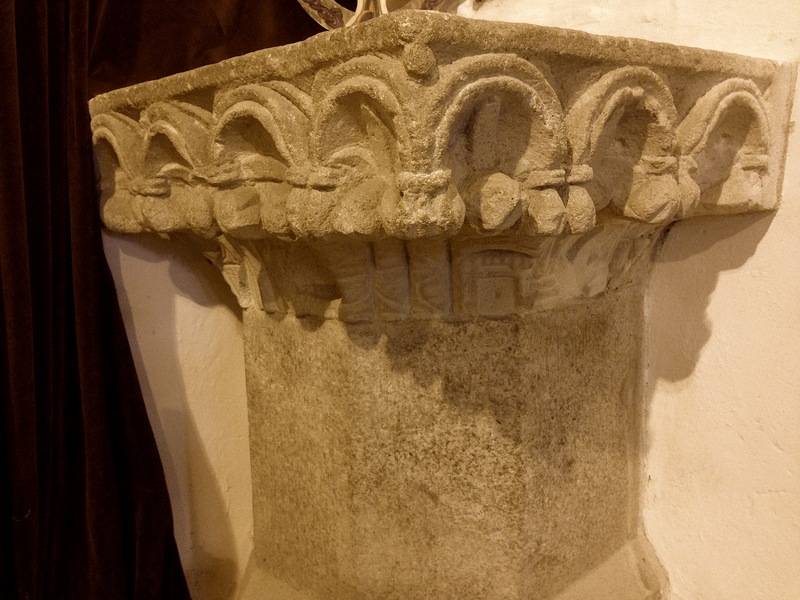 Above: The re-used capital at Lanivet, probably from Bodmin Priory (Photos: Alex Woodcock). Historic carved stones often survive only due to their re-use in another capacity. This is a clear example. It’s also a testament to the durability of the material itself, as well as the ability of the twelfth-century design to appeal to a new audience.